How does the 2NS work? Attenuates / reduces vibration transfer from speaker to floor. 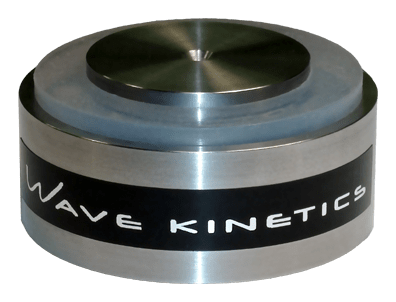 By reducing vibration transmission introduced to the floor we can reduce the excitation of natural resonant modes unnaturally accentuating certain frequencies and causing problems with phase response or “speed” in playback. As modes in the floor and structure are excited they can “ring” long after the musical signal that caused the excitation has stopped. The 2NS system utilizes Impedance mismatching, visco-elastic damping and intrinsic materials properties to achieve a 20-30 db Drop in vibration to floor transfer. Keep the signal accurate as it transfers from the speaker to the floor. a. Flat frequency response. – Poorly chosen materials can filter out certain frequencies and accentuate others so that the resulting signal passed to the floor is not even close to what is be generated at the speaker. Metal footers and spikes can impart a metallic ringing to the sonic signature due the characteristic resonances of the material being added to the vibration coming from the speaker. The materials in the 2NS signal chain are chosen and tuned to complement each other’s frequency response behavior. The combination of these different materials nulls out peaks and valleys in the frequency response resulting in an extremely flat signal transfer at the device-floor junction. b. Aligns or “polarizes” the vibration. – The visco-elastic ring surrounding the signal path damps out vibrations in the plane parallel to the floor leaving a predominantly single axis motion. This coherent vibration is evenly dispersed as it is transferred through multiple materials. Optimizes mechanical interface with the floor. The optimal flat surface area and extreme rigidity of the system bases allows the signal to pass into the floor in a very orderly fashion. Speaker spikes deform the surface of a compliant floor material such as wood. The fibers are crushed and deformed in the vicinity of the spike or spike disk leading to unpredictable vibration transfer. The geometry of the system bases was optimized to alleviate localized deformations The uniformly dispersed, acoustically neutral signal transferred to the base of 2NS system is transferred to the floor across an extremely stable and predictable junction. The attenuated but pure signal that is transferred to the floor is transmitted more accurately. What are the benefits of the 2NS? The 2NS Loudspeaker Interface System attenuates vibration transfer to the floor and cleans up the signal which is transmitted. It does all of this while providing a pure signal pathway and rock-solid stability under any speaker to ensure accurate response. The effects are both measurable and audible. When placed under a state of the art loudspeaker the 2NS reduced harmonic distortion by greater than 80%. This translates to a dramatic improvement in sound. You will hear increased speed and naturalness, tighter more tuneful bass, greater clarity and detail retrieval, more pinpoint accuracy and placement within the sound field, wider and deeper soundstaging with much more control especially at louder listening levels.